Perfect for commercial use, this high performance coffee maker urn from Town Food Service features an easy-to-read coffee level gauge, and brews an impressive 80 cups of coffee per hour. Constructed from a durable stainless steel, this coffee maker urn is virtually fool-proof to operate, easy to clean, and requires very little maintenance. Water level markings on this coffee percolator's interior ensures every operator consistently makes the perfect brew, so that you are never left with overly strong or weak coffee. Its two-way drip less faucet provides perfect coffee extraction, without mess, and its conveniently located ON-OFF switch provides simple shut down when coffee brewing is not needed. 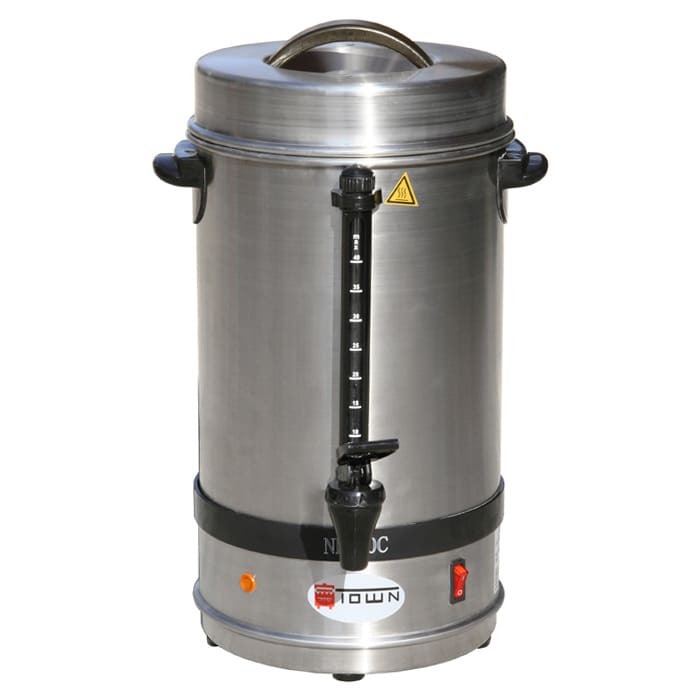 This coffee urn's heat-resistant base and handles reduce the chance of burns, making it safe for anyone to use. Use this coffee maker urn in churches, offices, lounges, and cafes as a treat for your employees and patrons. This easy-to-use coffee maker's serving area beneath the faucet accommodates a cup and saucer, and its cover removes easily but stays secure.